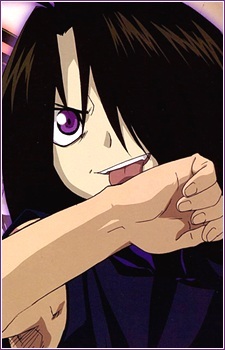 Wrath is the second youngest homunculi next to Sloth. He, like Pride, can age like a human. His ouroboros tattoo is located on the bottom of his left foot. Wrath is a special case among the homunculi in that he can perform alchemy, but does not have an "Ultimate" trait like the other homunculi, although some consider his alchemy to be "the Ultimate Alchemy". Like Edward, he does not need to draw a transmutation circle. Wrath can perform alchemy on material that no other alchemist can, such as a bed or his own body. It's revealed that Wrath is in possession of Edwards lost limbs, explaining why he can perform alchemy when the other homunculi cannot. Wrath seeks to take the rest of Edward's body for himself, hoping to become a full human. Because Wrath is so young and spent most of his life in The Gate, he developed a mother-son relationship with Sloth, and will do anything to protect her. Wrath's weakness also differs from the other homunculi. Seeing The Gate of Truth paralyses Wrath with fear, and he cannot stand the sound of a crying baby.